Like quizzes? Well, you are in the right place! I am thrilled to be sharing a giveaway for a seat in the upcoming class, Quizapalooza by the fabulous Angie Lucas! If you know Angie, she definitely has a way with words! You can find out more about Angie here. There's no question about it: your story matters. And there's no easier, faster, or more satisfying way to tell your story than through quizzes and questions! 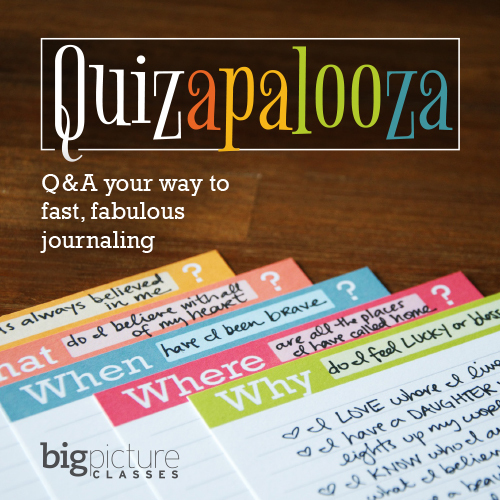 Introducing Quizapalooza, a 5-week interactive workshop that makes it simple to share meaningful stories in your scrapbooks, journals, and Project Life albums—or even via your blog or social media channels. There are options for whichever memory keeping method you prefer: Project Life, scrapbook layouts, your journal, blog, social media, etc. I love this! There is no one right way and it's great we have options. Even if you normally do one thing, you may find you enjoy trying something new. Check out the video for more information. It's really good and makes me want to take some of these quizzes as well! In fact, Angie has some sample quizzes available for free here. Let me know if you try these out! I'll be working on mine as well. And if I had time I would show you my "Groovy Little Book of Quizzes" that I made using quizzes from Simple Scrapbooks back in the day. But, I figured you might like a chance to win and so I will go ahead and post this. Done is better than perfect, right? Still, you get the idea…I love quizzes for journaling and page / story prompts. And I can't wait for this class! To be entered in the giveaway, please leave a comment below. You can also enter the giveaway on my photo on Instagram. The class starts September 18th, so I will choose a winner next Sunday 9-14-14.